claire can't see me. | a mom who is cooler in words than in life. sometimes i forget how my imagination works. how for survival as an only child i took to befriending walls at night time carrying on extensive, albeit onesided, conversations to pacify my fear of the dark…which was really just the precursor to my fear of being thought of as boring. my love of brick morphed seamlessly into my love of sheltered hearts. & my night time routine of creating grand story lines out of the stoic silence of sleeping chests only served to turn my imagination into reckless abandon for your truth. to me you were no longer boy with quiet charm, beautiful in your simplicity. you were a half filled beaker of potential in the endless experiments of my life. my objective was to find the combination of concoctions that would cause a stir, a rustled feather, a gut reaction, and ultimately an explosion that would turn the dormant liquid at your core into something solid…some tangible thing that would serve as your souvenir to remind you that you’ve been in & survived my chaos. A grand & shiny new object that you would eventually turn into a wedding ring for the next girl…because i acknowledged what your heart only mumbled…i was never meant for you. reckless girls like me, too big for their britches, too loud in their outlandish theories (crafted in freshmen lit classes), too selfless in their sacarfices but too selfish with their attention, never amount to more than a cautionary tale in the memories of a sheltered heart. so we learn to be hurricanes. a downpour of something so foreign that in the first few moments you are in awe, in the next few moments you are terrified, and in the last moments you are planning how you will rebuild in preparation to avoid all future disasters. so back to my imagination. i made up a story line for you the last night you slept so soundly in a bed too small for my dreams & your needs to fit. you were always going to be too boring for me, I told the hairs on the back of your neck. you were always going to need me to draw you a treasure map to find me, complete with land mines for you to memorize to avoid, i whispered to the rhythm of your breathing. you’ll never know when it is time to limit me & time to give in completely, trusting my gut over yours, I reminded your shoulders as they rose & fell in a shrug. & then I prayed into your spine that you wouldn’t remember me at all & that I would only remember the story line that I created of you. because if I wasn’t a girl who feared the dark, & feared being boring, & talked to walls (or men built of them) you wouldn’t have been there to craft a story out of. with love from me then and not me now. 1. 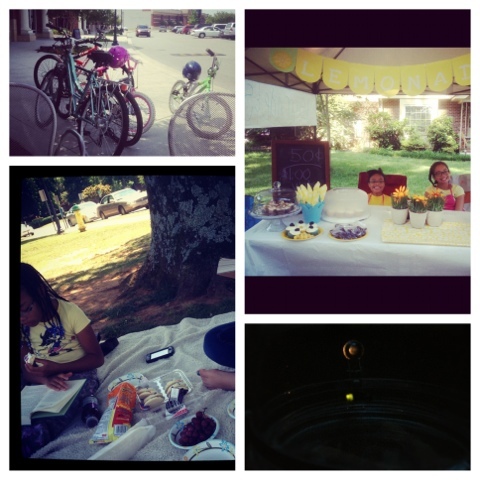 Lemonade stand to fund Amiia’s film project. Lesson? It takes a long time to sell a cup of awesomeness…and some people won’t ever buy it..but keep going because someone will come along. Took four hours to make $37. Perspective? Four hours ago, Amiia, you were at $0.00. 2. 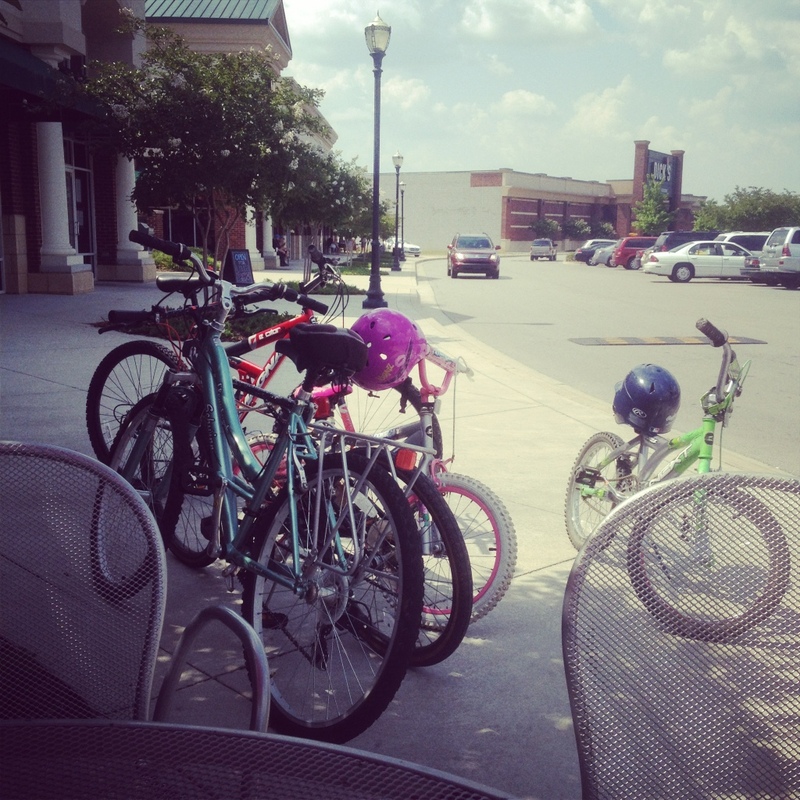 10 mile bike ride in 93 degree weather to teach that even when you want to quit…you parked too far away to stop now. 3. Swimming…to prove that summer has actually started. 4. Percy Jackson Picnic in the park, but to gain entrance to the picnic everyone had to buy something worth at least $3 to contribute to our snacks. Why? How else will they learn to contribute to the community? 5. Caught fireflies to practice patience, but let them go with a wish on each wing. 6. (tomorrow) Going to learn to churn butter…to teach “it ain’t where you’re from, it’s where you’re at”. Bike ride sounds like great exercise, right? What happens when you ride straight to Five Guys? Ha! as to where i’m leading you next. 1. amiia asked me what “fly like a g6” meant. 2. i adore that my kids are so clueless to “popular music”. 3. avery started kindergarten. day 1-3 were good, day 4 was not so good, and day 5 we started to act like our momma is crazy & ended the week on a good note. 4. i really should be taking a sleeping pill & trying to sleep through the entire night without waking up to add something to my to do list on my iphone in the dark. 5. that is an incredibly long sentence…that’s how i know its grammatically incorrect. 6. green curry. what a yummy thought. 7. (the jewel) so, if you know someone that is constantly criticizing the things you do, don’t reevaluate your life, just reevaluate keep THEM in your life. & with that i bid you adieu. i never rewrite my poems. still might. It’s snow days that I loathe. 2. Miia thinks we have the best snowman on the block because he has a mohawk. 3. I have lost 7lbs since New Years, but this “blizzard” is fking with my work out schedule. 4. Who needs ice cream in freezing weather? Anthony. We risked life & limb on black ice for a pint. 5. If you tell anyone that I bought Kanye’s album I’ll bury you under an avalanche. 6. Dead birds falling out the sky, dead fish washing a shore, and snow in Alabama? Yep, Babylon is a fallin.